Minesa’s PQRSS management system is a tool of control and continuous improvement for all processes and corporate actions in relation with the community of its area of influence. Petition: It is the right of every person to respectfully file a petition for information about specific or general matters. Complaint: The expression of annoyance or inconvenience as a result of a direct action of Minesa or its staff, which implies an alleged affectation caused by any activity of Minesa’s project operations. Claim: The expression of dissatisfaction for an alleged breach of contract by Minesa, including suppliers. Request:The call for support, for help, or for information which does not correspond to a petition, complaint or claim. Suggestion: The expression or proposal for change or for intervention about internal or external activities of Minesa, filed by employees or members of the community which are oriented towards the improvement of the process. How are the PQRSS filed to Minesa? PQRSS mailboxes are located at Mi Punto (downtown California, El Santuario Hotel), La Higuera campsite and in the townhalls of California, Suratá and Matanza municipalities. PQRSS applications are available at Mi Punto, La Higuera campsite and the townhalls of California, Suratá and Matanza municipalities. They should be filled (clearly specifying the type of request) and deposited in the PQRSS mailboxes. How long does Minesa take to answer PQRSS? Every filed PQRSS is handled internally and Minesa will answer within the following terms depending on the type of request. Request, Complaint, Claim and Petition: In the terms that the law establishes. 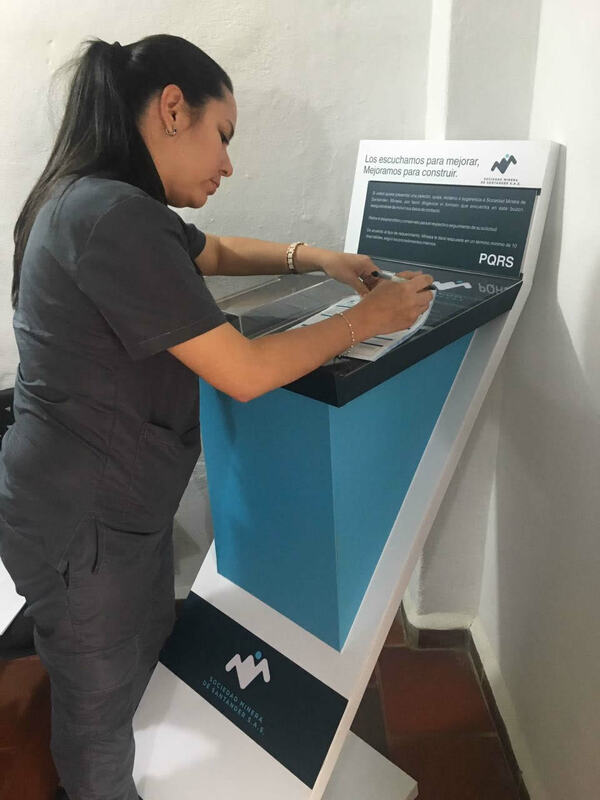 Through the PQRSS management system, we strengthen our mechanisms of interaction with the community and we identify opportunities for improvement which allow us to build an environment of harmony and reciprocity.